Our first two days in Sydney! After a relaxing weekend in the Blue Mountains, we made the 2 hour train journey back into Sydney city centre. 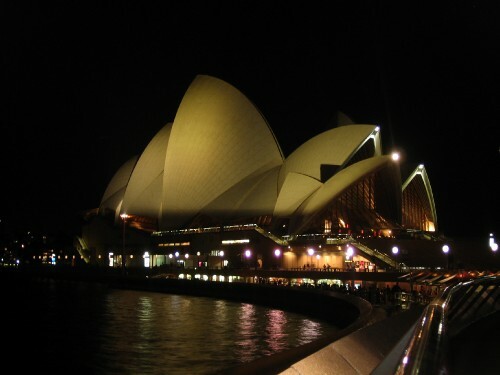 As we left the station, we got our first glimpses of the Harbour Bridge and Opera House, which was breathtaking! After struggling along in the heat with our heavy backpacks, we were glad to finally find our hostel - only 5 months old with great views overlooking the Opera House and Harbour Bridge. It seemed more like a hotel than accommodation for backpackers so are making the most of our stay here! Luckily we'd managed to find a discount loophole which allowed us to avoid the expensive room rates. Having arrived on a Sunday afternoon, we decided to check out the weekend 'Rocks' markets, right under the Harbour Bridge, which had a great atmosphere (despite the 36 degree celcius heat!). Henry bought a cricket poster which he was very pleased with although slightly concerned about getting it home in one piece! 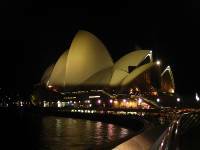 We then went for a walk around the harbour to have a closer look at the Opera House. It was amazing to see it close up but we were surprised at how different it looked in 'real life' - you could definately tell it was built in the 70s! Today was spent exploring the city centre. We visited the Hyde Park Barracks Museum which gave an insight into Sydney's convict history, followed by a visit to Hyde Park, Darling Harbour and the Chinese Gardens. It was a very hot day again but we tried not to let this restrict us in wandering round! We both really like the 'feel' of Sydney and think it may be one of our favourite places to have visited yet! A cooler day has been forecasted for tomorrow (27 degrees) so we've planned to do a free walking tour of the Rocks area and a tour of the Opera House. We're moving to Sydney Central hostel the day after which will give us a chance to explore a different area of the city. Early next week we're heading to some of the beaches and have booked in at a hostel near Bondi Beach, where you can have some free surfing lessons! Think that's about all our news for now. Thanks for all the messages you've sent, it's great to hear all the news from back home. Hope the snow has disappeared!